Grace Coleman and Garrett Cooper have been colleagues since long before the birth of BenefitMany. Before his days as a CEO, Garrett worked as a Consultant and Researcher at the Bayer Center for Nonprofit Management at Robert Morris University, doing strategic planning, financial analysis, and governance consulting. One of his early clients was Crisis Center North (CCN), the nonprofit that Grace runs. 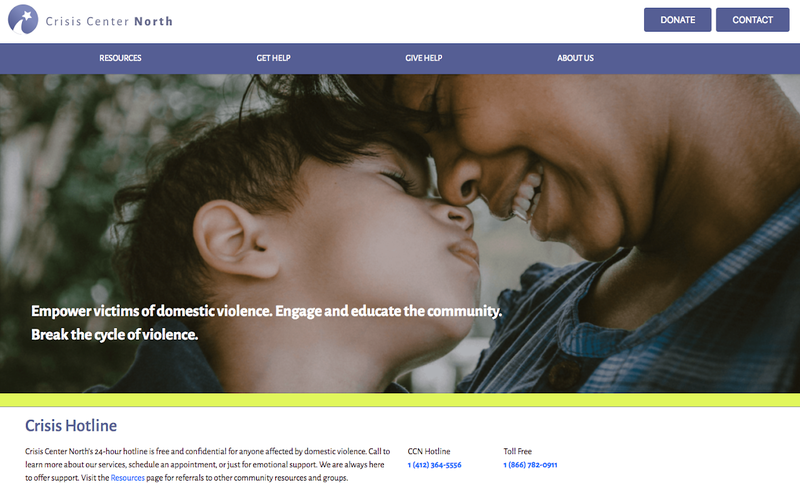 CCN is a domestic violence counseling and educational resource center serving the northern and western areas of Allegheny County. The mission of Crisis Center North is to empower victims of domestic violence and cultivate community attitudes and behaviors that break the cycle of violence, a mission statement that Garrett helped forge during his work with the agency in 2008. CCN’s ultimate goal is to create and provide innovative trauma-informed services to victims of domestic violence in our community. Garrett’s passion for assisting non-profits and “helping the good guys” made this project an important and memorable one. So, in 2017 when Grace saw some room for improvement in CCN’s website, her choice of who to reach out to was an easy one. Due to their limited marketing budget, CCN’s website is “critical to connecting with the community.” Given that knowledge, CCN knew that they needed to put some work into their then-outdated website, but found that the initial framework of the website made it was difficult to update. When she came to BenefitMany for help, she knew that Garrett and the team could not only build the beautiful, seamless website they needed to improve their marketing and PR efforts but that it would be delivered with the careful attention to their wants and needs. “BenefitMany is reliable, efficient, and honest in its interaction with clients. These are fundamental values that are important to CCN,” Grace says. When he asked why he started BenefitMany, Garrett often talks about how he wanted to use his tech-savvy skills and passions to help nonprofits positively change the world. Very much the other half of the equation, when Grace speaks of CCN, she says “saving lives is our expertise, but technology is not.” Sounds like a match made in heaven, doesn’t it? Furthermore, Grace noted that there is something to be said about the general enjoyment of working with BenefitMany. “The entire team was relatable,” Grace says, and “not only was the final product they built for us important, but how we felt about the process and the product was important to them as well,” a statement that the BenefitMany team takes pride in — after all, this is their goal as a company. Even further, the team loved to hear that through working with them, Grace learned that she had valuable insights to offer in the website’s construction (of course she did!) and that her applicable skills could aid the technological process. As a team, BenefitMany knows the importance of listening to their clients’ insights — that the background knowledge they have of their audience is key to building a successful product. It’s always nice to hear that your clients value you for the goals you aim to achieve, isn’t it?